It is the first FNSI with friends for 2013. I plan to work on my Lancaster Quilt and try to get the rest of the border flowers appliqued on. I am doing this post from my bed with a box of tissues very close. Hope you feel a little stronger as the day goes on. Maybe a nana nap should be on today's agenda. Hoping you feel better tonight Sharon!!! Sounds like you may need a good nap this afternoon, to get you through, if you can manage it! ... I know what you mean about the school fees - Would *love* to spend my amount at the LQS, but then, that's the price you pay when you want private Christian education for your daughter ... I'm *not* going to be happy come Tuesday when I put my dollars down! I know exactly how you feel. We have a total of $800 for just text books this year and also need to get a $200 calculator for the eldest for maths. Some stupid graphing thing that can attach to the laptop apparently. I've been picking them up slowly as they come in so haven't noticed it much and we are waiting for the last 5 to turn up. Xmas club account will be topped up more now to cover the books for next year I think and I pay off the fees all year. SO much for cheap public education! Maybe you could consider home schooling- that might save you some money, but probably give you less sewing time! I hope you are feeling better soon! Hope you're feeling better soon Sharon. A good dose of stitching should help. Along with little servants making you cups of tea and getting you whatever you want! LOL! Sorry to hear you are not well, that quilt is looking lovely. I am visiting mum and dad tonight so no sewing for me. Your Lancaster quilt is coming along beautifully. I hope you give the lurgy the old heave ho quickly. 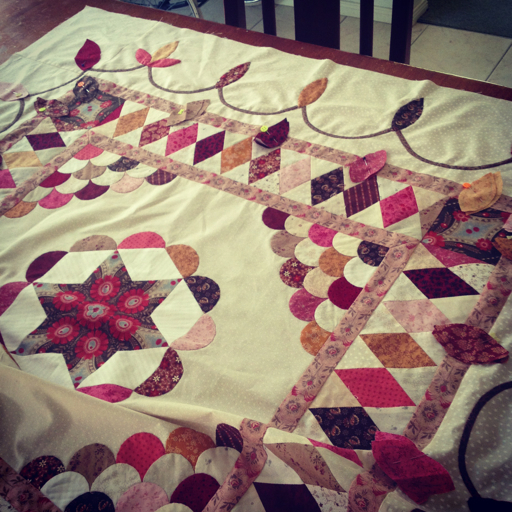 Your Lancaster is such a beautiful quilt, you are doing great work on it. As for the fees......it's a small price to pay for the peace you will have next week. Hope you feel better soon - maybe a medicinal fat quarter? Gosh that's not good being sick - hope it is short lived and that you are back on your feet soon. Love your Lancaster! Gee I hope you're starting to feel a bit better :( Not nice to be sick when you want to sew....did you get my email in regards to the Bliss fabric?? :) Barb. Hope you are feeling better . I was in a shop yesterday that had a dolly and me quilt on the wall. It is just Devine. Your daughter should love it.